In a large bowl, combine the corn kernels, creamed corn, eggs, cheddar, smoked paprika and salt and mix well. Heat a large frying pan and add some oil. Fry spoonfuls of the batter until bubbles appear at the top and flip. Allow to cook on the other side. Remove from the pan once cooked and place on some kitchen paper to drain. In the meantime, combine all the ingredients for the salsa and mix well. 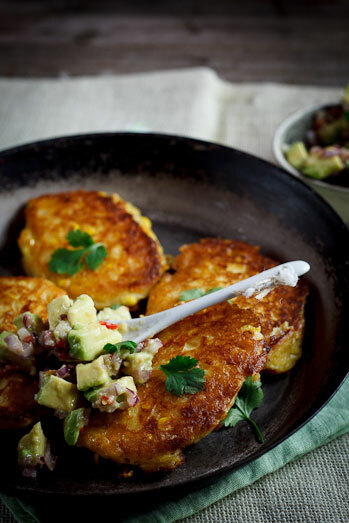 When all the cakes have been cooked, serve them with the salsa, extra lemon wedges and fresh coriander.